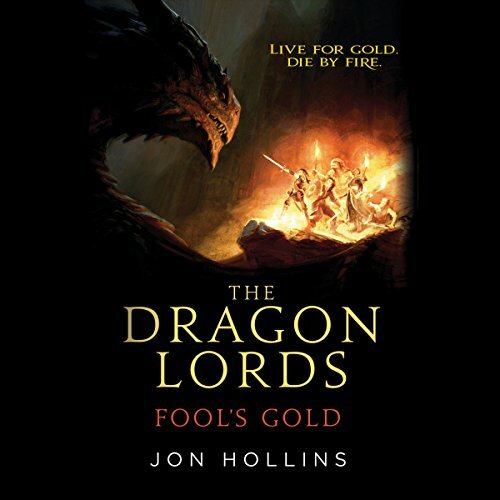 First off, thanks to Hachette Audio and Libro.fm for an audio copy of Fool’s Gold (The Dragon Lords #1) in exchange for an honest review. Receiving this audio copy does not influence my thoughts or opinions on the novel or author. One of the easiest recommendations I can make if you enjoy audiobooks. Jon Banks is again phenomenal and never ceases to make daily commute highly entertaining. Have you ever come across a book that exceeds your expectations? Well, Fool’s Gold completely exceeded mine and I now can’t believe I waited until now to get to it. Pegged as Guardians of the Galaxy meets The Hobbit, it was a no-brainer to at the very least get a copy of the book (plus, you know, being a cover snob and all). What I didn’t expect was to be truly enamored by Hollin’s (aka Jonathan Wood) writing, especially the humor that he weaves in and out of every part of the story. I know he is a funny guy based on his social media presence, but it shines brighter on paper. Will Fallows is farm boy from one of the poorest villages in Kondorra Valley. Finding it difficult to make ends meet, thanks in large part to the Dragon Consortium raising taxes at an exorbitant rate each year, he slaves away in the hopes that his days will get better.Well, unfortunately for him, they get worse. His farm is seized by Lord Mattrax’s soldiers and Will is left with nothing to his name. On the trail to an unlikely new beginning, Will becomes fast acquaintances with two traveling mercs, Lette and her 8-foot tall lizardman, Balur. Will tells them of his plight, and the three set off to recruit a couple more unusual bandmates: Quirk, aptly named and gifted with magical ability, and Firkin, an old drunkard who used to work for Will’s father on the farm. The five of them contrive a plan to steal from Mattrax, the Dragon Lord who is the cause of all this grief, and in doing so, bring some life back into the Valley. Being one of the most idiotic and insane plans every devised, Will is quick to point out how quickly they will fail and how the entire Valley is doomed to perish once they do. But knowing how rich they will become if they succeed binds them into blind faith. It is really difficult not to get the correlation between this novel, Guardians, and The Hobbit. There are so many nods to the two that you will get a headache, you know, from all the nodding. It is an insanely fun novel with LOL humor, but it also has tons of heart, a tinsy bit of world-building and character development, and some fantastically drawn up heist and fight scenes (especially the ending battle that I can only compare to Eames’ Kings of the Wyld and Tolkein’s The Return of the King). It’s YUGE and claustrophobic at the same time, and it has all of those “there is no way they will win this fight” elements you see across the board. But, having said all of that, Balur is the best thing about this novel. If you enjoy Batista’s version of Drax in Guardians, you will adore Balur. He is being one of the best characters of all-time in my books (pun not intended) and yes, I meant for that sentence to be grammatically incorrect (you’ll have to read the book to get the intent). Overall, if you enjoy fantasy books with “I see what you did there” humor, Fool’s Gold needs to be in your collection yesterday. I feel that there is plenty in here to love for the average fantasy reader, and even enough to satisfy the cravings of the most seasoned of readers. Highly recommended for those who love Guardians of the Galaxy, The Hobbit, Kings of the Wyld, the Ocean’s movies, or even Josiah Bancroft’s ‘Books of Babel’ series (which Banks also narrates).